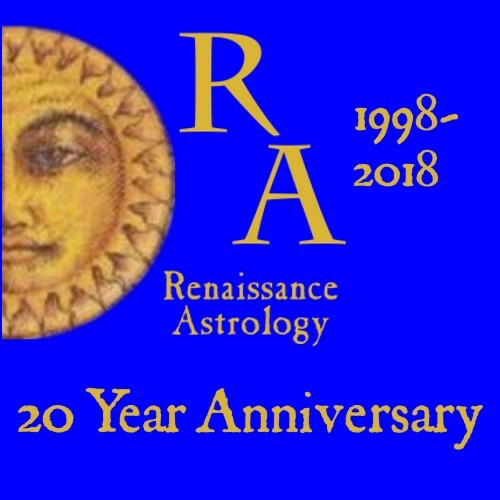 2018 is a real milestone for me and for Renaissance Astrology because it was in 1998 that I became a professional astrologer and made my first astrological talisman, so this is my 20 year anniversary! You can actually see the chart of this first talisman and fuller explanation here. Interestingly enough my first talisman was a malefic one, albeit a pest control talisman. My experience made me vow to never again make a malefic talisman and I haven't to this day. It's this sort of practical application of astrological history and theory that's really characterized my long journey. And you can see much of that journey on the Renaissance Astrology website. I started the Renaissance Astrology website in 2000 and Google tells me that it has indexed 765 pages on the site. Wow! That's a big website! It's really been a combination of individual and collective effort. In many ways I minimize my own contribution and see myself as a link in the Aurea Catena, the Golden Chain of Hermetic Initiation that extends back to Hermes Trismegistus himself. The traditional astrology and astrological magic that I practice is almost entirely derived from our traditional sources, taught to me by my teachers in the traditional horary lineage of Olivia Barclay and magical theory and philosophy from Robert Zoller. On the other hand, I do get some personal credit. In 1998 no one was publicly practicing or teaching traditional astrological magic, at least not using full chart elections. I spent 12 years working to translate and publish Picatrix, the key grimoire of astrological magic (John Michael Greer did an amazing job and translated about 75%, I did the remaining 25% including making sure the astrological sections made sense). I've created or supervised the creation of hundreds, by now perhaps thousands, of authentic astrological talismans. I've taught astrological magic to hundreds of students, ensuring that this ancient knowledge is a living tradition. I think it is fair to say that I single handedly revived traditional astrological magic. Another additional and somewhat invisible role that I've played is in the practical structuring of how astrological talismans are elected and how talisman elections are explained and presented. As anyone who's had a reading from me knows, I am a bit unusual in doing written readings. Maybe this is my professional training, but I find I can think better when I write. I get the impression that many astrologers do a reading by calling you on the phone, casting the chart and riffing on the chart with the client. This is fine, but I like having a written record of the reading, particularly with horary. It keeps everyone honest about accuracy and allows for transparency. So as part of a written reading, I always provide complete chart information, with the time, time zone, date and location. For a talisman election, I also provide the title and chapter or page of the traditional source used for the recipe and then provide the astrological factors that I relied on. Now, as I mentioned I was the first person to openly provide authentic astrological talismans on the Internet. I was the first to provide the full chart information, traditional sources and the factors used for the election. I also emphasized that, according to our traditional sources, the talisman needed to be consecrated when made and needed to be made, not just consecrated at the elected time. It's hard to explain how revolutionary this was. No traditional astrologer would touch astrological magic. No site explained how to do it, no one had any practical experience with it. No one taught it. You could not buy authentic traditional astrological talismans. Previously all that was available was astrology themed jewelry, or site with vague claims about ancient magic, but no traditional sources and no attempt to do full chart elections. Now I'm starting to see more sellers of astrological talismans. Some of the sites look fancy and they follow my lead in many ways. They say (and I have no reason to disbelieve) that they are astrologically timing the creation of the talismans. I haven't seen actual astrological charts, but some sites will list the astrological factors used to elect the making of the talisman. Lots of sites like to use Picatrix or other traditional source quotes. I've watched the evolution of these sites and I can see what an incredible influence Renaissance Astrology had on them, as they move closer and closer to the format for astrological talismans that I created. It's too much to expect that I'd get any acknowledgement on their sites, but I decided it was at least time to stand up and take credit for inventing a whole new business category, which is authentic traditional astrological talismans. Most of these sites are jewelers that were and are selling a lot of esoteric themed jewelry, for these guys, it looks like astrological talismans were a complimentary product line. Others look more specialized. This post is my attempt to strike a balance between excessive modesty where my contribution is left unnoticed and going off on some silly rant. I really don't see anyone as a competitor. I'm pleased that clients are getting sophisticated enough to want authentic astrological talismans and I am happy that this ancient art is getting more popular. Given the amazing power of astrological talismans there is more than enough business out there for everyone. It's true I invented the business, and I'm dismayed if I see Renaissance Astrology designs, images or texts sold by others, but that doesn't mean that there should be any barrier to the creativity or legitimate profit of others. While the elections I see are sometimes still problematic, I am increasingly impressed by the beauty of the astrological talismans on offer and willingness of more and more Internet sellers to create true authentic traditional astrological talismans. I think it is great to see how successful traditional astrological magic has become. From nothing in 1998, in 2018 this ancient art flourishes! I am privileged to have played the leading role, but there can be no doubt that I couldn't have done it without our illustrious predecessors, my teachers, students, clients and colleagues.